The Walking Dead revisited the infamous location of Glenn and Abraham's slaughter in Sunday night's Episode 9x09. Spoilers for The Walking Dead Mid-Season Nine premiere follow. Major spoilers! After escaping his prison cell and Alexandria, Negan journeyed to the Sanctuary looking for a place to call "home." However, his journey went south when the only people he knew turned out to be walkers and supplies were completely scarce. The only thing he found was a leather jacket, a pipe, and some dogs to chase him. When he hit rock bottom from drinking foul water, he found himself at the location where things went south for him: the place he killed Glenn and Abraham in The Walking Dead's Season Seven premiere. 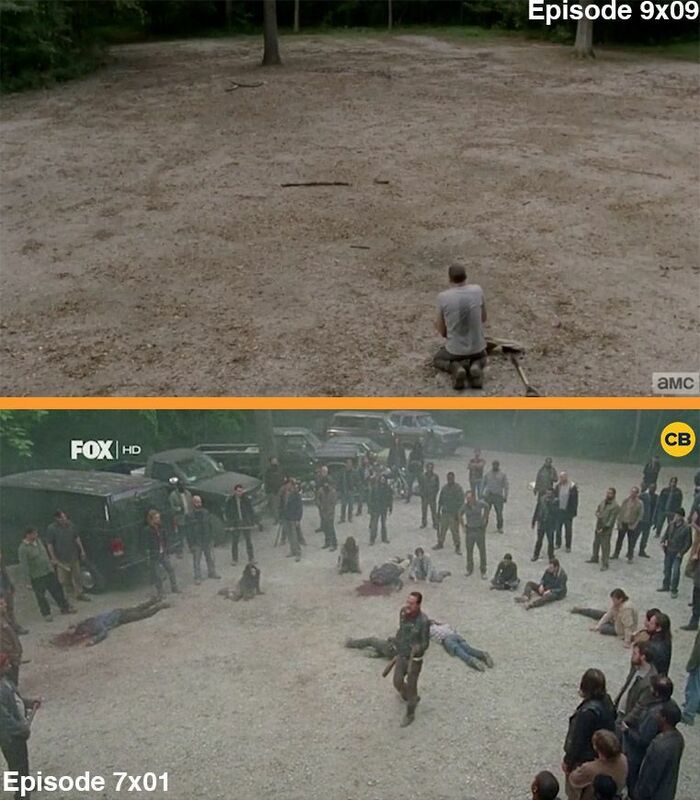 Check out the photo below, comparing Negan's time at the infamous slaughter site seven years apart from one another. "I think it's saying a lot," The Walking Dead executive producer and director of Episode 9x09 Greg Nicotero told ComicBook.com. "I think it's saying that probably he made a mistake, and everything that he has done was the wrong way of going about it. And so instead of him being the king of kings, and living in sanctuary in the lap of luxury, he's now a man alone with no one. And it all started with that moment where he killed Glenn and Abraham. So I really felt that just that little piece of inspiration for me really added a tremendous amount to Negan's journey." The scene, in fact, is intended to show Negan's current state of mind which is one of both desperation and regret. "That was something, when the script came out and we were talking about Negan's journey and the highs and the lows, and the wins and the losses," Nicotero explained. "It's a win, he kills the walkers, and then all of his supplies are destroyed. Then he finds water, and he drinks it and then he vomits. And then he finds the leather jacket, but then he gets chased away, and then he gets back to the Sanctuary, but it's all overrun, it's ruined. "Negan goes through all of these ups and downs that have to lead him to this final place, which is, it doesn't matter what the world is if you're not surviving with people, and that's what makes him want to come back. But I'm glad you caught that, because I had called Angela at one point, and said, 'What if we actually go back to the clearing? So when Negan is vomiting the water after he drank it, he looks around, and if somebody is paying attention, they're going to realize that Negan went right back to where it all started. Now he's on his knees.'"